The engine internal combustion unit produces a lot of heat – at times temperatures hit over 200 degrees. If you have leaking hosepipes, it could reduce the amount of coolant in the engine. If the problem is not remedied immediately, some engine components will start to fail. The cooling system consists of the radiator, coolant, thermostat, anti-freeze solution and hose pipes that circulate the coolant. The coolant major role is to absorb the heat from the engine, transfer it to the radiator, and fan for cooling. A thermostat regulates the amount of coolant that is distributed to the engine and radiator. The first thing you need to be on the lookout for are signs of low engine coolant. Driving with low engine coolant is never a good thing to do. It can create air bubbles in the system, which in the worst case can damage your engine seriously. Here are a few things that can happen in your engine when you are driving with low coolant. 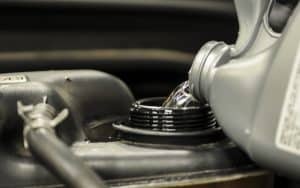 If you do not take care of low engine coolant immediately, the engine will start overheating, and there will be a spike in temperatures on various engine hot spots. The head gasket will start leaking allowing more coolant into the engine system. This coolant will go into the combustion chamber, and this will reduce the car’s power. The car could come to a complete standstill, and you could find yourself with a destroyed engine. Low engine coolant is not a problem for hot seasons but also during freezing conditions. If temperatures drop so much, they will solidify and become ice. This is the case for cars that use normal tap water without an anti-freeze. It is recommended that you have a 50:50 ratio between the coolant and water. One sign of low engine coolant during the cold season is a heater that blows cold air even when it is set on hot. Most of the engine components are made from metal. If you experience low engine coolant some of these components may start developing rust. The anti-freeze often has chemical compounds that protect engine components from rust. If the coolant is low, these components are exposed. When the head gasket starts leaking the coolant levels will start dropping without any noticeable signs of leakage. To identify a blown gasket check the end of the oil dipstick – if you notice that has bubbles or has a milky liquid, then the gasket could have blown. This requires urgent attention, and you will be forced to drive the car to a service station. There are a few signs that you can check for when you want to know if the coolant is too low. However – the easiest way is of course to open the hood and check the coolant reservoir. When the engine is being cooled normally the temperature gauge on the dashboard will be below the half-way mark. If it moves up and down, then there is some problem. If there is a rise in the temperature gauge check your radiator for coolant levels. You can water until it overflows and continues observing the gauge. If the problems persist, then you are certain of coolant leakage. It is dangerous driving with low engine coolant as it will destroy engine components. If you suspect that you have low engine coolant, stop the car and check underneath the hood. In cases of leaking pipes, you will notice water droplets underneath pipes. If the leaks are not severe, you can put a stop leak to your radiator. This handles minor leaks and is not a permanent solution. You should later take your car for a checkup or purchase new radiator hosepipes. Anti-freeze leakages are characterized by green or orange water droplets. The car’s heater uses the same coolant that runs through the engine. Valves are used to control the car’s coolant inflow hence regulating the temperature. If your heater is not working as expected, then you could be suffering from low engine coolant. The anti-freeze is a compound that is included with the coolant to prevent the water in the radiator from solidifying during cold seasons. One distinguishing characteristic of the anti-freeze is that is has a sweet smell. If you notice that your engine is producing a sweet smell, then the cooling system is leaking. The engine cooling system enables the engine to operate at optimal levels. When you are experiencing low engine coolant the fuel will burn faster and your consumption increases. If temperatures are too low, then the fuel does not vaporize effectively, and you may have problems accelerating. Whenever the engine gets too hot, the coolant is vaporized and passes through a small tube. The overflow reservoir has markings that determine when the coolant has expanded and needs to be expelled. If you suspect that you are running at low engine coolant check whether the overflow reservoir is above or below the set minimum and maximum points. The radiator cap can be faulty forcing the coolant to spill away. The engine can be very hot turning most of the coolant into vapor. It is very dangerous to open a radiator cap when the engine is hot. This is due to the pressurized coolant that can cause severe burns. Wait until the engine cools down and pour some cold water on the cap before opening it. Radiator caps are affordable, and you can replace them before your next service appointment. The coolant plays an important role in cooling the car’s engine. Ignition of the fuel and air mixture produces a lot of heat which when not dissipated can cause serious engine problems. You will notice that you are experiencing low engine coolant when the temperature gauge on the dashboard starts to rise. If this happens, stop the car immediately and check for leaks. The reasons for low engine coolant vary including faulty radiator cap, leaking hosepipes, to leakages in the gasket. You will notice that your car’s power reduces during leakages. There is also the sweet smell of the anti-freeze fluid. Check at the bottom of the car bonnet for coolant drippings. A pipe sealant can be used to temporarily seal the small leaks in the hosepipes. 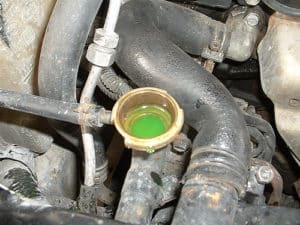 It is not safe to continue driving a car that has low engine coolant. Further coolant leakages in the engine could cause other crucial components to blow up; it also leads to corrosion of engine parts.